This map shows the frequency of carbon dioxide frost's presence at sunrise on Mars, as a percentage of days year-round. Carbon dioxide ice more often covers the ground at night in some mid-latitude regions than in polar regions, where it is generally absent for much of summer and fall. Some dusty parts of Mars get as cold at night year-round as the planet's poles do in winter, even regions near the equator in summer, according to new NASA findings based on Mars Reconnaissance Orbiter observations. Carbon dioxide is the main ingredient of Mars' atmosphere. The planet also has large reserves of frozen carbon dioxide buried in the polar ice caps. Seasonal buildup and thawing of carbon dioxide frost at high latitudes on Mars have been studied for years and linked to strange phenomena such as geyser-like eruptions and groove-cutting ice sleds. Here's what's new knowledge: the presence and extent of transient overnight carbon dioxide frosts, even at middle and low latitudes. 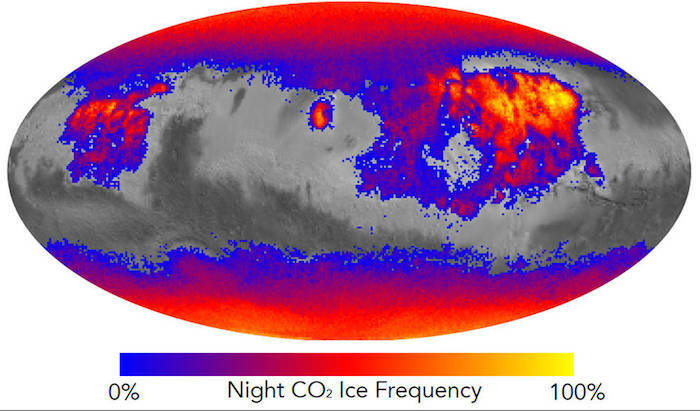 Infrared-wavelength observations of dust-covered regions by the Mars Climate Sounder instrument on NASA's Mars Reconnaisance Orbiter not only indicate cold-enough nighttime surface temperatures for carbon dioxide frost to form, they also detect a spectrum signature at night consistent with a trace of frost. "The temperature gets so low, you start freezing the atmosphere onto the surface," said Sylvain Piqueux of NASA's Jet Propulsion Laboratory, Pasadena, California, lead author of a report on these findings published online by the Journal of Geophysical Research: Planets. "Once you reach that temperature, you don't get colder, you just accumulate more frost. So even on the polar caps, the surface temperature isn't any colder than what these lower-latitude regions get to overnight." Three middle- and low-latitude areas in the Tharsis, Arabia and Elysium regions of Mars have nightly temperatures cold enough for carbon dioxide frost year-round or nearly year-round. Each of the three is bigger than Texas. All three are dust-covered to the extent that surface temperatures change much quicker than in areas with exposed-bedrock surfaces. Piqueux said, "These same regions that are coldest at night are the warmest during the day. It has to do with the nature of the material -- it's so fluffy. Think of when you're at the beach on a summer afternoon, where you step on the fine grain sand. You almost burn your foot, it's so hot at the surface, but just below the surface it's not as hot, and if you touch a boulder, it doesn't feel as hot. Then it's the opposite at night: The surface of the sand cools off quickly, while the boulder stays warm." Unlike the polar regions, at lower latitudes the atmosphere is warmer than the ground at night. A critical step in understanding just how cold the ground in these areas gets at night was correcting observations of the planet's surface for slightly warmer atmospheric temperatures. Temperatures are determined from orbit by analyzing the infrared radiation oserved at the top of the atmosphere; this includes radiation from both the ground and the atmosphere. The Mars Climate Sounder instrument, by observing both sideways toward the horizon from orbit and downward, can record infrared emissions from a cross-section of the atmosphere, as well as from the planet's surface. Analysis then reveals the true -- colder -- ground temperature. The same instrument also provides readings at multiple infrared wavelengths, yielding results consistent with the presence of microscopic-scale carbon dioxide frost crystals forming a layer no thicker than a few sheets of paper. "If at night you form little frost crystals between the grains of dust on the surface, pushing the grains apart, then the frost crystal becomes a little puff of air in the morning, that might be helping to maintain the fluffiness of the surface," Piqueux said. "You prevent the cementation of grains, the locking together of grains into a more consolidated surface. It's a self-maintaining process: Where you keep the soil fluffy, you maintain the conditions to form frost at night." "A cycle of carbon dioxide frost that happens every night could be related to other active processes on Mars," said Rich Zurek, JPL's chief Mars scientist. "This agitation of the soil would affect surface physical properties and could have implications for erosive processes and for the exchange of water vapor between the atmosphere and surface." Many streaks on Martian slopes appear to be slides of dry material, with no liquid involved. The lubrication effect of carbon dioxide frost thawing directly into gas has been linked to such slides where winter frost thaws in spring. Daily frost cycles may have similar effects. Another type of slope activity on Mars is called recurring slope lineae (RSL). These appear as dark streaks advancing downhill in a warm season, then fade away, then re-appear the next warm season. Hydrated salt has been confirmed at some of these sites, and they are considered the strongest evidence for the possible presence of liquid water on the surface of modern Mars. "Although RSL appear to start on steep, rocky slopes, the realization that overnight carbon dioxide frosts occur even during warm seasons adds another factor to be considered in RSL activity," Zurek said. The science instruments on NASA's Mars Reconnaissance Orbiter have been examining Mars since 2006. JPL, a division of Caltech in Pasadena, manages the mission for NASA's Science Mission Directorate in Washington and built the Mars Climate Sounder. Lockheed Martin Space Systems of Denver built the orbiter and supports its operations.